Anyone who regularly does dance or movement will know that keeping joints and muscles warm is imperative to ready them for peak performance. These lightweight ToeSox Dance and Yoga Legwarmers have a chunky-look, with a cable detail ribbed knit, made in a blend with natural wool. 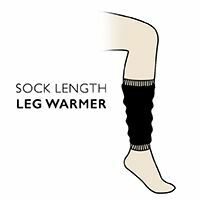 ToeSox Dance and Yoga Legwarmers can be pulled high on the thighs or scrunched down around the ankles, with a 102cm - 40 inch long measurement that will fit most people.